Veteran Hotel GM Stresses on "People before Profit"
Q1: First, thank you very much for this interview chance. People say that the Grand Hilton Seoul has improved a lot on many sides since you were inaugurated as the new general manager. What are your major achievements so far? What were the differences before and now? A1: Creating bridges between department's heads and earned a stronger team work based on trust. The operation is more efficient and hassle-free. Coaching and counseling employees on the payroll since 1988 was my first priority to support and motivate them to be productive. Bringing all newly hired employees up to speed with our newly established CORE VALUES and with guiding principles. The fruits of that labor earned us more revenue, better profit and higher guest satisfactions better than before. Actions speaks louder than words. 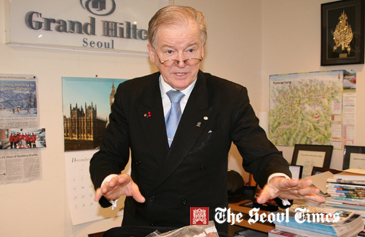 Mr. Bernhard Brender, general manager of the Grand Hilton Seoul, speaks to The Seoul Times in his office. Q2: Compared with other major hotels in Seoul what, do you think, are the advantages of your hotel? What makes your hotel different from others? Can you also mention the areas of your hotel that need improvements? A2: Being nestled around the green Baekryun Mountain is a major advantage. Besides our eco-friendly Green Zone with our three in one business concept a super-deluxe hotel with 396 rooms, an award winning convention center and Suite Serviced Apartment we have the perfect market mix. We help to attract with our MICE and Incentive Business more Tourism coming to Korea supporting the KTO with its new dynamic President Charm Lee . Q3: What are your plans to make your hotel even better one? What are your major tasks for further improving your hotel during your tenure? Do you have any interesting promotional plans? 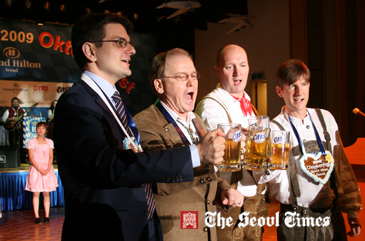 Mr. Bernhard Brender, general manager of the Grand Hilton Seoul, hosts Octoberfest event at his hotel in Hongeun-dong in 2009. A3:Last April we had a traditional Netherland's Food & Culture Festival bringing a chef from the Rotterdam Hilton. Then in September 10/11th our well established Octoberfest will take place at the Convention Center attracting 2,000 citizens of Seoul guests. Q4: A lot of people in South Korea alone praise you for your special way of treating people including your friends, particularly your ability as a top hotelier. What is your management philosophy? A4: Respecting people and listening to them are the cornerstone to build friendship and comradery. Being in a foreign land I need to adjust to the culture and share my knowledge, time, and money with them. 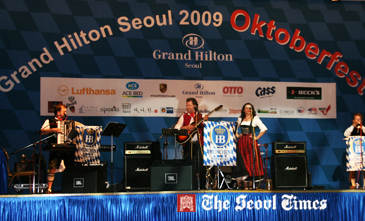 Octoberfest 2009 event hosted by Mr. Bernhard Brender, general manager of the Grand Hilton Seoulat his hotel in Hongeun-dong. Sharing my 40 years of experience working in 10 countries on four continents with my employees and guests is helpful to be understood and be accepted. We all like to be treated with an honest, friendly, and open-minded attitude. Q5: Hotel business is getting more and more important in South Korea, as the nation’s economy grows and people’s quality of life grows as well. Young people fresh out of college say they want to advance into hotel business, as I understand. What advice would you like to give to the starting hoteliers or would-be hoteliers? A5: Stay humble and be creative. And be ready to learn each day something new. Learn the English language well and go for other languages like Chinese, Japanese, French, German, and Spanish. 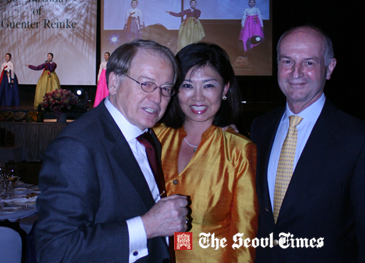 Mr. Bernhard Brender (left), general manager of the Grand Hilton Seoul, poses with Mr. Juergen Woehler (right), secretary general & executive ditector of Korean-German Chamber of Commerce and industry (KGCCI: AHK) at the birthday part of Guenter Reinke, CEO of Boehringer-Ingelheim Korea at a Seoul hotel on April 24, 2011. 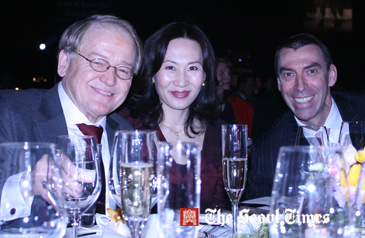 In between is Mrs. Mi-Kyoung Woehler, Asia-Cirlce president. Never stop learning and communicating with people. In the hotel industry to be able to speak and be understood and understand is the key factor for success. Traveling around the world and experiencing the real world open the mind into the global level of understanding. Q6: You have helped many major hotels in Korea as its top manager. What are they and how did you help them for their business? A6: I started in 1991 at the Grand Sheraton Walker Hill, laying the ground work for the new “W” to open. In 1998 when Starwood bought Sheraton from ITT in Boston, the Westin Chosun and Busan became one family under the Starwood umbrella. I was appointed by President Chang of the Westin and President of Starwood Ted Teng to be the AMD/GM moving to the Westin Chosun. After four years another challenge I took to join the Hilton Company when Chairman of CDLhanded me the legentary Millenium Seoul Hilton in 2004-2006. Finally I was asked by Chairman Lee Woo-Young, owner of the Grand Hilton Seoul, to manage the Grand Hilton until this present day, and the hotel is my home away from home. Helping the owner to generate maximum revenue and profit. I just train, coach, and counsel all employees to focus on the guests so that they return happily. A7: The most single private moment was when I met my wife Mutati Diasvera in 1975 which became my live souvenir from Bali from Indonesia until this present day. Most difficult time still in Africa — one night after 18 hours of working at the hotel to find a big Python Snake on the street slowly crossing the road in front of me. It was very difficult to breathe and to stay focused, knowing what she can do to you. I prayed and the snake moves on and I drove home in sain (*). 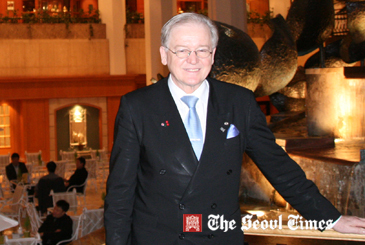 Mr. Bernhard Brender, the general manager of the Grand Hilton Seoul in Hongjae-dong, is a veteran hotelier who has spent nearly 20 years out of 30 years of his career in hotel business. The Grand Hilton Seoul stands atop as one of the premiere hotels in Seoul. Yet, earning this status didn't come easy as Mr. Brender, their general manager, explained in a recent interview with The Seoul Times. 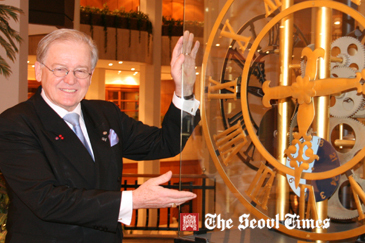 Mr. Bernhard Brender, general manager of the Grand Hilton Seoul, poses with his friends at the birthday part of Guenter Reinke, CEO of Boehringer-Ingelheim Korea at a Seoul hotel on April 24, 2011. His success and prominence as the “top hotelier” did not come easy. He had to climb the ladder of success in the hotel industry through hard work and insatiable quest for something new. Friends say he never cease to asking questions about anything. Mr. Brender is filled with a passion for his job as well as his Roman Catholic faith. He participates in numerous volunteer activities with his motto being, "The answer is yes. What is the question?" He explains how he must keep earning money to give much of it away to the poor.